Step-by-step guide on how to use Chromecast Audio to stream music to your speaker, and 2 methods to control Chromecast Audio from your mobile device. Chromecast Audio is an unique product in the market for music streaming. It turns your dumb speaker into an internet speaker: you can stream music anywhere to the speaker. Although it is not complicated, some new Chromecast Audio owners may still have problems to use Chromecast Audio to stream music properly. Some may have no idea on how to control Chromecast Audio from their mobile devices. This Chromecast Audio guide shows you how to use Chromecast Audio to stream music, and how to control Chromecast Audio from your mobile device. Please note, I assume you already setup your Chromecast Audio. If not, please follow this guide to set up Chromecast Audio first. How to use Chromecast Audio to stream music? To use Chromecast Audio to stream music to your speaker, you may follow these steps. Make sure the audio cable is inserted into Chromecast Audio and the speaker tightly. Chromecast Audio does not have a power button. You just connect the USB cable to Chromecast Audio and power adapter, then plug the power adapter to electric socket to power on Chromecast. Please note, Chromecast Audio may update the firmware and reboots itself if it is not used for sometime. You cannot use Chromecast Audio when it is updating. So, wait till the LED is solid white. Some speakers may have its own power button. You need press or turn it to turn on it. launch the app as a normal app from app drawer (apps screen) or home screen. launch the app from the first tab in Chromecast App. Please refer to this guide on how to use the new Chromecast app. If the app supports Chromecast Audio AND one or more Chromecast or Chromecast Audio devices are found in the network, a casting icon will be shown in the app. For example, as shown below, in Google Play Music app, and TuenIn radio, apps, you can find the casting icon near the top. 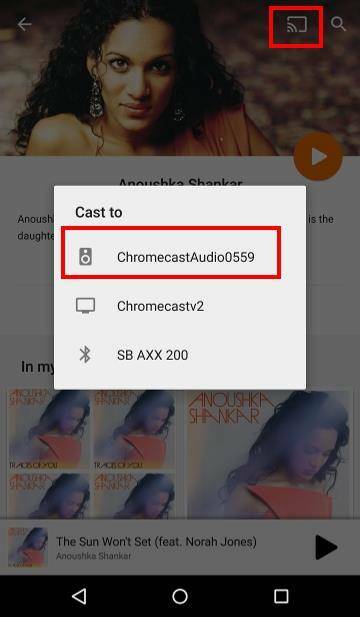 Tap the casting icon to use Chromecast Audio device. As you want to use Chromecast Audio, you need select the Chromecast Audio to be used as shown below. Step 4: Enjoy the music. You should hear a beep in the speaker once casting is successful. The casting icon now also turns full. You can then use Chromecast Audio to stream music to the speaker. If you already played music/audio on your mobile device, the app will use Chromecast Audio to handle the music playing. The playing on your mobile device will stop. So it may have a short break. Once music is plying to the speaker, you can do whatever else on the phone. You can even turn off WiFi on the phone because Chromecast Audio will handle everything. 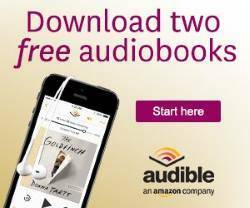 But if you want to choose another playlist or another program, you need re-connect your mobile device to internet and select the playlist or music from the corresponding apps. How to control Chromecast Audio from your mobile? Some Chromecast Audio owners are not sure how to stop the casting. The only button on Chromecast Audio is for you to do a factory data reset (FDR) for the device. You simply cannot control Chromecast Audio from Chromecast Audio! You need apps. And you can control Chromecast Audio in 2 ways with different apps. The Chromecast app in any devices in your network can control Chromecast Audio. 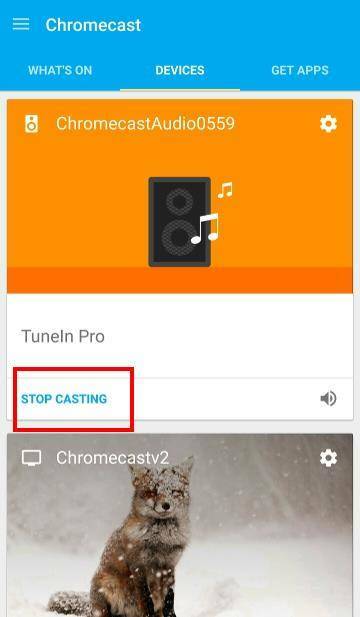 You can also use the streaming app to stop casting. But only the mobile device who initiated the streaming has this control. This is different from the method of using Chromecast app. For example, the following 2 screenshots show the 2 different ways to control Chromecast Audio. 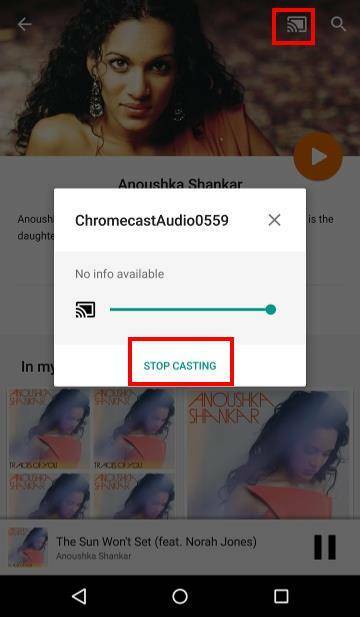 In Google Play music or any streaming apps, tap the casting icon as shown below, then tap Stop casting as shown below. Or in Chromecast app (from any devices in your home network), under device tab, you can tap Stop casting as shown below to control Chromecast Audio. Can you use Chromecast Audio to stream music to the speaker? Can you control Chromecast Audio from your mobile device? If you have any questions or encounter any problems on how to use Chromecast Audio, or how to control Chromecast Audio, please let us know in the comment box below. The community will try to help you find the answer or solution. For more Chromecast Audio guides, please visit Chromecast Audio guide page. I am unable to cast the music from my phone to Chromecast Audio. The reason seems quite simple: The pre-installed Music app (which I put all my music on) on my brand new Galaxy S5 does NOT feature a casting icon. Presumably the only way to make this work is to go through the laborious and costly process of importing all my music to some other app that happens to support casting. Any ideas? If music file is on the phone, you can use Play music app to play them. Play music app of course support Chromecast audio. The default music app in S5 is simple a player. All other music player apps can also play music files on the phone. Some may support less formats. Sorry to disagree but you cannot cast music on a phone with Google Play app, you have to load it into Music Manager first, not what I wanted.